Youth learn about media literacy as well as the theories and cultures of storytelling to situate themselves and creating personal narratives. Photography skills are developed to enhance the power of their narratives. Youth learn song structures and songwriting concepts, before transitioning into practicing percussion, making beats, writing rhymes, and developing melodies. The workshop concludes with a live recording. Youth participate in organizing video ideas into a storyboard for production including shots, scenes, locations, and characters. Acting as a team the youth will produce a video integrating youth storytelling and music into an overall narrative. The project wraps up with youth showcasing their artistic creations for their peers and the greater community. Celebrating the youth’s work and understandings of place, environment, and sustainability is essential in building leadership, artistic voice, and regional connectedness. 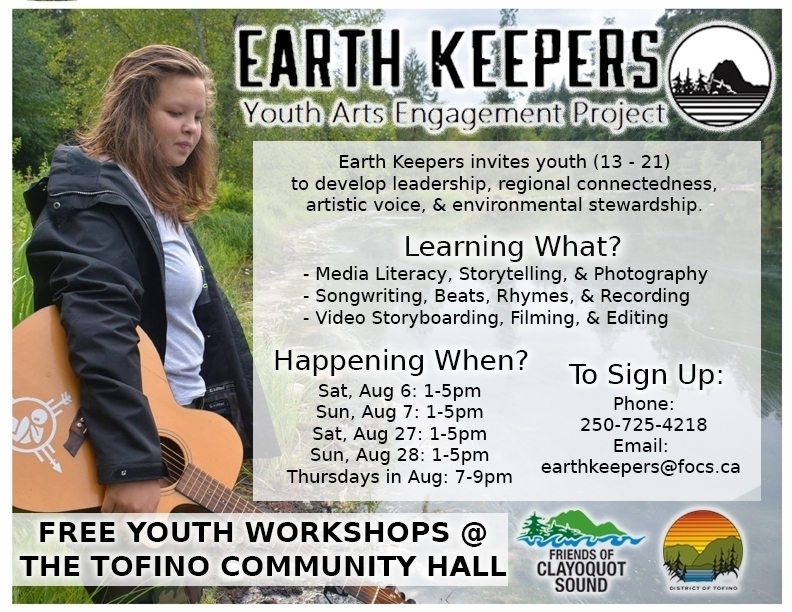 The program will be based out of Tofino, but will also be taking place in Opitsaht, Esowista, Ty-Histanis and Ahousaht in order to create an interconnected youth culture. Media Literacy: Youth will learn media literacy. Identity: Youth finding themselves, finding a voice by going outside of their comfort zones while receiving encouragement, compassion and support from community. Youth Voice: Youth will develop skills to enhance personal communication through creative storytelling through engaging with music, photography, and video. Leadership: Increased creative output and self-expression will empower strong and vibrant youth leaders, environmental educators, and earth stewards. Remote Media Production: Promote multimedia education and offer opportunities for youth to learn practical skills in media production despite living outside of urban media centres. Encouraging a lifestyle of personal connectedness to the environment. Modeling personal responsibility for the environment and a commitment to sustainable living. Promote learning and critical thinking about both local and global environmental issues. Increase public awareness of regional environmental issues. Engage youth in activities that promote healthy lifestyle choices. Youth exploring their identities in relation to their places, as well as sustainability issues important to them. Increased regional connectedness and integration of youth, families, and communities. Facilitate community access to photography, video, music and performance. Increase community support and promote youth artists, writers, performers, musicians, photographers, and video/ media producers.